In the photo above, dust circles a worker during the construction of the Hawks Nest Tunnel in 1930. Workers on the project were exposed to toxic levels of silica dust; hundreds ultimately died. 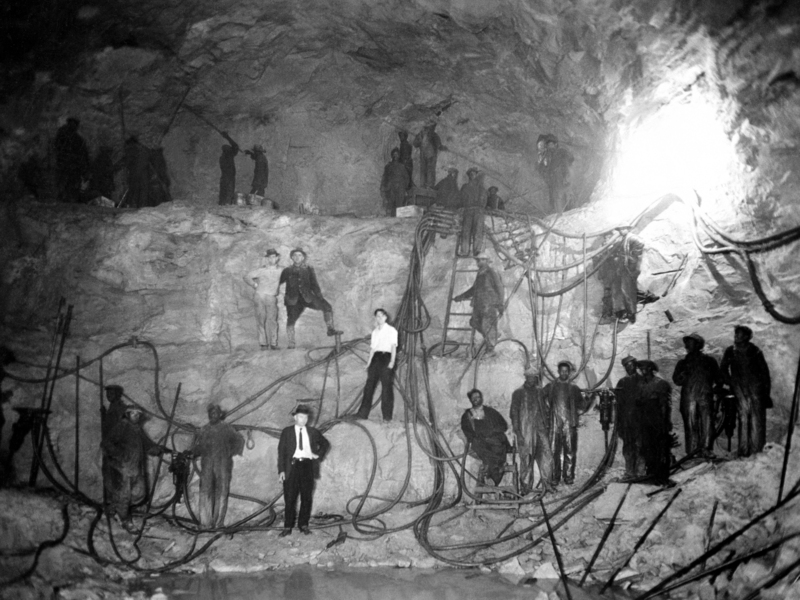 An African-American man poses with others in the photo above while working on the Hawks Nest Tunnel in 1932. Thousands of black men came to West Virginia to work on the project, making up the vast majority of the workforce. A drilling crew poses for the above photo in 1931. 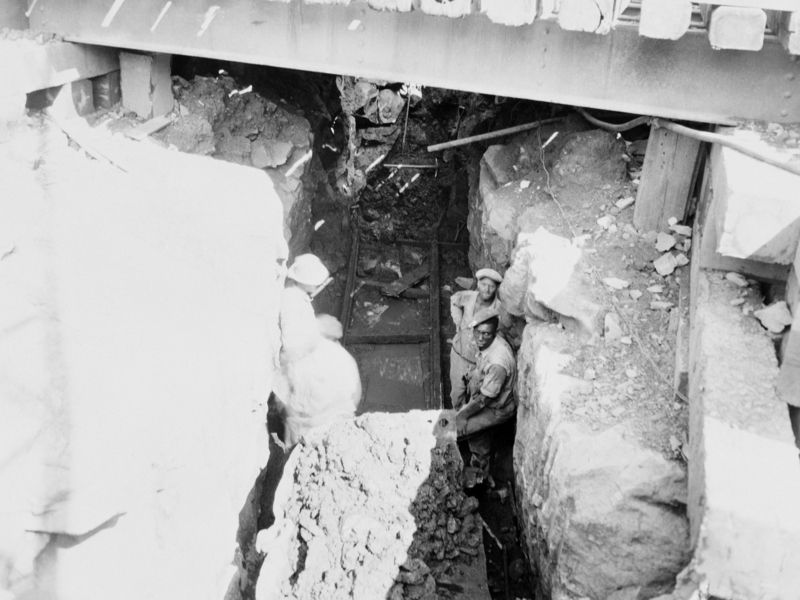 To create the Hawks Nest Tunnel, workers had to drill through nearly pure sandstone, which kicks up toxic silica dust. 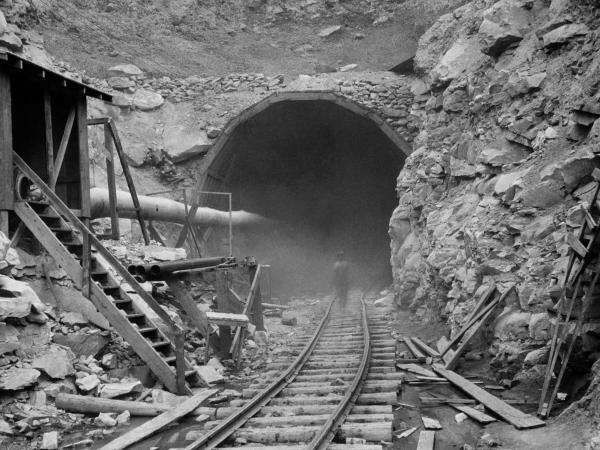 Workers in the photo are not wearing respirators — a requirement later mandated by Congress after hundreds of men died from exposure to silica in the tunnel. 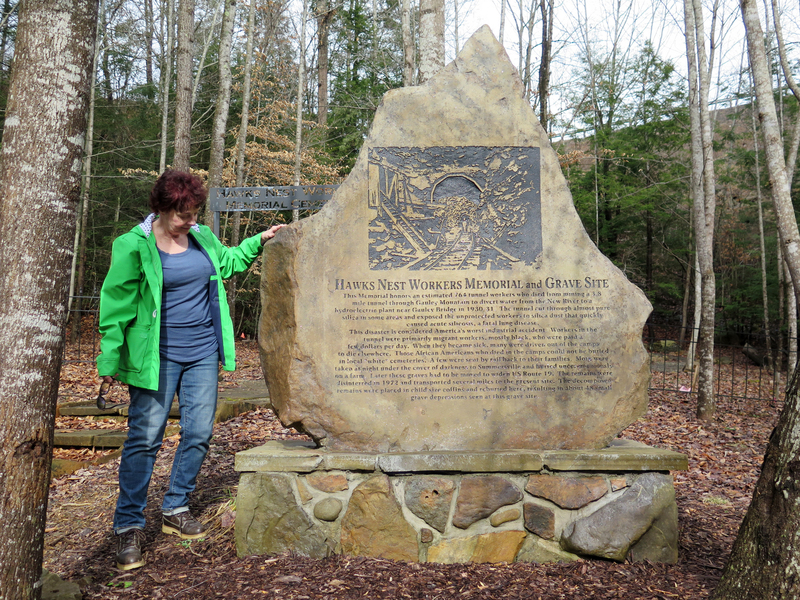 Whippoorwill Cemetery in Summersville, W.Va., serves as the final resting place for many of the men who died after working on the Hawks Nest Tunnel. Charlotte Yeager, a local newspaper publisher, is the caretaker of the Whippoorwill Cemetery. 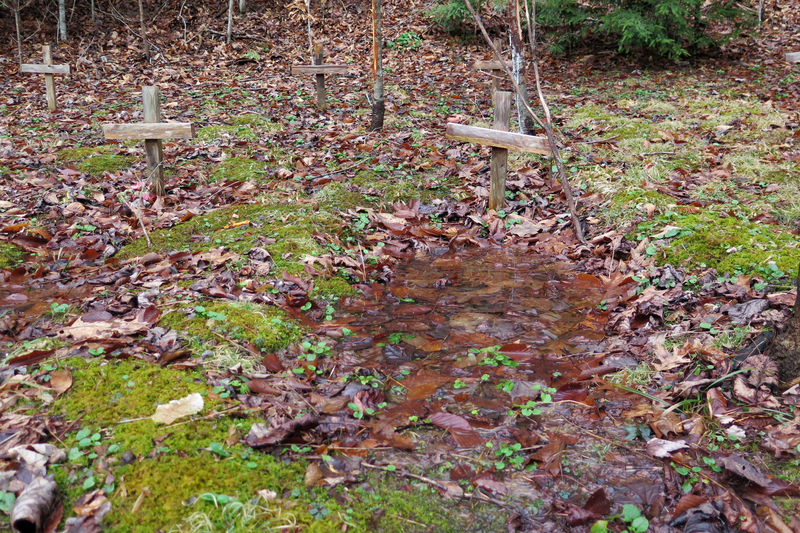 Water pools on a grave at the Whippoorwill Cemetery. Black lung, an epidemic of the coal miners' disease, is killing thousands of miners across Appalachia. NPR and the PBS program "Frontline" have been working together over the past year and uncovered that the U.S. government repeatedly failed to prevent the outbreak despite multiple opportunities to act. Black lung is caused by breathing in toxic silica dust found in the rock coal miners cut through to get coal. But this isn't the first time silica dust has ravaged a community. NPR's Adelina Lancianese has the story of what's called the Hawks Nest Tunnel disaster, which killed hundreds of workers nearly a century ago. ADELINA LANCIANESE, BYLINE: The Hawks Nest Tunnel is still considered an engineering marvel today. Water rushes through the tunnel in Gauley Bridge, W.V. 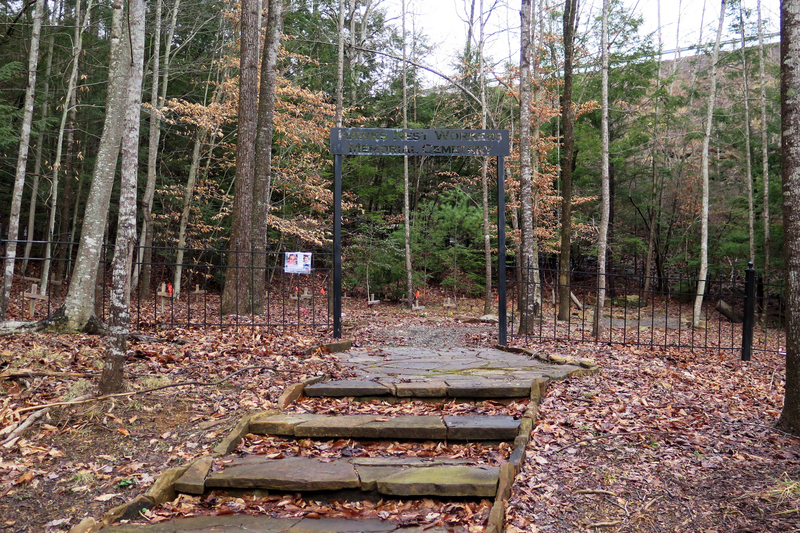 Its gate is visible from the lush Hawks Nest State Park on the mountain above. CHARLEY JONES: My name is Charley Jones. I live in Gamoca. LANCIANESE: But almost 90 years ago, this place looked much different. This is tape from a 1930s newsreel about the project. JONES: I lost three sons, from working in the tunnel, of silicosis. One is 18, one 23 and one 21. LANCIANESE: It was the Great Depression. Americans were desperate for work. The tunnel project attracted thousands to West Virginia. And most of them were black men fleeing the South. LANCIANESE: That's Reverend Matthew Watts. WATTS: ...And realized what they had gotten themselves into. LANCIANESE: He's a minister and an amateur historian in Charleston, W.V. WATTS: The idea that I can go to a place and work. My kids can possibly go to school. I can have a right to vote. And I'm probably - have a very low probability of being hanged - right? - that was attractive. That was paradise. And when they got here, they found that, in this case, they had ended up in a hellhole, literally. LANCIANESE: A corporation called Union Carbide had an audacious plan for the workers. Construct a 3-mile-long tunnel through a mountain to divert river water and do it in just 18 months. Thousands of workers drilled holes and then stacked dynamite in them to blast through pure quartz, a type of rock that kicks up silica dust. Silica dust is especially toxic. Once inhaled, it slices at the lung like shards of glass, suffocating workers from the inside out. They came out caked in it, says Catherine Venable Moore, a writer who's documented the tragedy. CATHERINE VENABLE MOORE: There was a nickname at the time for Gauley Bridge - the town of the living dead - because there were so many sick workers and, I think, also because they had this kind of ghostly presence when they were coming out of the tunnel being covered in this white silica dust. LANCIANESE: Workers were pulling shifts of 10 to 15 hours. And they didn't understand just how quickly the dust could kill them. Here's another worker on that 1930s newsreel. UNIDENTIFIED MINER: I worked in Hawks Nest Tunnel for four months. And each and every day that I work in that tunnel, I had to carry off 10 to 14 men - was overcome by the dust. MARTIN CHERNIACK: The local doctors really were not quite clear, at first, what they were seeing. We had young, healthy people breaking down and developing acute and severe respiratory disease in a very short period of time. And there really isn't a lot of precedence for that. LANCIANESE: Dr. Martin Cherniack of the University of Connecticut wrote a book about the tunnel. He estimates more than 760 workers died of silicosis in just 18 months' time. CHERNIACK: So what would happen is they would become sick, profoundly short of breath, have severe weight loss, basically be unable to move and function and exercise themselves. LANCIANESE: The African-American men were treated the worst. According to later congressional testimony, they were denied 30-minute breaks in the clean air. They were paid less. And if they were too sick to work, their supervisors would force them from their beds at gunpoint. They died in droves. And they were quickly replaced - Matthew Watts. WATTS: There was a mentality, you know, that the contractors that were supervising the Hawks Nest Tunnel had. Kill a mule. Buy another one. Kill a man. Hire another one. LANCIANESE: When one of those men was Dewey Flack. He was African-American, 17 or 18 years old. His age is unclear because, like hundreds of other black tunnel workers, only a few traces of Dewey's life and death remain. Records do show that Dewey was working hundreds of miles away from his home in North Carolina. He would never return. SHEILA FLACK-JONES: My father mentioned when I was young that he did have a brother. LANCIANESE: This is Dewey Flack's niece Sheila Flack-Jones. FLACK-JONES: But the brother, he thought, had run away. LANCIANESE: She didn't know anything about the Hawks Nest Tunnel or her Uncle Dewey's fate until NPR found her through genealogical records. FLACK-JONES: I'm heartbroken that my family died thinking that he had run away, and they never knew the real truth. LANCIANESE: Dewey died two weeks after his last shift in the tunnel. His death certificate is mostly blank. But cause of death is listed as pneumonia. Like many other black workers who died at Hawks Nest, no next of kin was identified. FLACK-JONES: I'm really, really angry. Here it is 100 years later. Do I mourn for my uncle, the one that I never knew? Do I mourn for my family because they thought he had left? Or do I mourn for what he would have become had he lived? These are things and questions that I'll never have an answer for. LANCIANESE: Union Carbide and its contractor denied any wrongdoing in a congressional hearing. And lawsuits filed against them were settled out of court. Local workers who died were interred in their families' cemeteries. But black migrant workers like Dewey Flack were loaded together on wagons. Records suggest their bodies were eventually buried in unmarked graves in what's now called Whippoorwill Cemetery in Summersville, W.V. At a recent visit, fallen branches and loose cobblestones cover the ground. Rain pools in a coffin-shaped indentation, caving in from decades in the soft dirt. This grave is one of about 40. They are scattered throughout the property, all identical, each with a single, wooden cross. It's impossible to know which one belongs to Dewey Flack. Adelina Lancianese, NPR News. JOSH WHITE: (Singing) I said, silicosis, you made a mighty bad break of me. GARCIA-NAVARRO: You can find our full investigation into black lung on npr.org. The "Frontline" documentary "Coal's Deadly Dust" will be broadcast this coming Tuesday. You can see it on your local PBS station. WHITE: (Singing) You robbed me of my youth and health. All you brought poor me was misery. Transcript provided by NPR, Copyright NPR.